The United Nations envoy for Syria is stepping down after gains this year by Syrian, Russian, and Iranian forces in reasserting control over much of the country, eclipsing prospects for an international peace deal ending Syria's seven-year civil war. 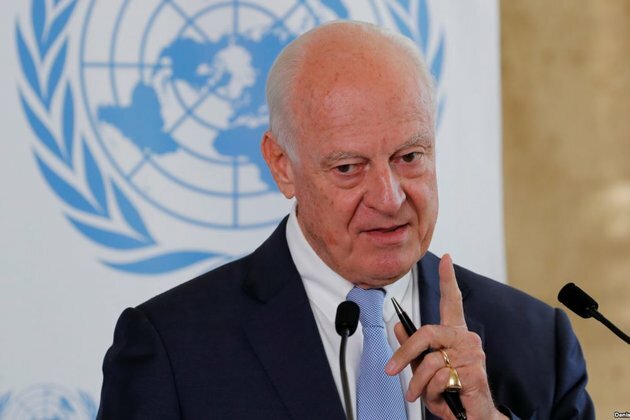 Staffan de Mistura said on October 17 that he is resigning his post after four years in November for 'purely personal reasons,' and claimed that despite Syrian President Bashar al-Assad's advances in the war, he will only secure a lasting peace if he submits to a UN-backed peace deal. De Mistura is the longest serving of three UN mediators during the long conflict. His predecessors - former UN Secretary-General Kofi Annan and veteran Algerian diplomat Lakhdar Brahimi - both quit in frustration over a global stalemate on how to end the war. The best hopes for a UN-backed solution to the war now hang on vows by Western leaders not to provide badly needed funding for reconstruction of the devastated country until Assad submits to a political power-sharing deal and new elections. De Mistura told the UN Security Council that Secretary-General Antonio Guterres had instructed him during his final weeks in the job to 'verify once and for all' whether a credible, balanced constitutional committee can be convened. Participants at a Syrian peace conference in Russia in January agreed to form a committee to rewrite the Syrian constitution that will be made up of 150 people, with a third chosen by the government, a third by opposition groups, and a third by the United Nations. But de Mistura said creation of the panel has been delayed because 'questions continue to be raised, mainly by the Syrian government, over the composition' of the UN list. The UN sought to balance its list 'so that no political side could dominate the committee,' he said, but the Syrian government reportedly wants its supporters to dominate the UN list so its views will prevail in making changes to the constitution. The UN council has long been deadlocked over Syria, with Western powers pitted against Syrian ally Russia, which has been backed by China. The war in Syria has killed more than 400,000 people and displaced millions more. 'We need to be patient,' Nebenzya said.